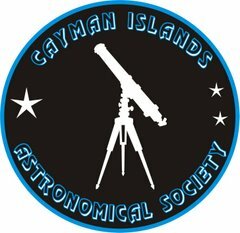 There are “winds” in space as well as around the Cayman Islands, albeit of a very different nature. A stellar wind is a flow of neutral or charged gas ejected from the upper atmosphere of a star. Different types of stars have different types of stellar winds. Post-main sequence stars nearing the ends of their lives often eject large quantities of mass in massive slow winds. These include red giants and supergiants, and asymptotic giant branch stars. These winds are likely to be driven by radiation pressure on dust condensing in the upper atmosphere of the stars. G stars like the Earth's Sun have a wind driven by their hot, magnetized corona. The Sun's wind is called the solar wind. These winds consist mostly of high-energy electrons and protons (about 1 keV) that are able to escape the star's gravity because of the high temperature of the corona. Massive stars of types O and B have stellar winds with lower mass loss rates but very high velocities. Such winds are driven by radiation pressure on the resonance absorption lines of heavy elements such as carbon and nitrogen. These high-energy stellar winds blow stellar wind bubbles. Although stellar winds from main sequence stars do not strongly influence the evolution of the stars, during the later, post-main sequence phase, mass lost by stellar winds can decide the fate of the star. Many intermediate mass stars become white dwarfs at the ends of their lives rather than exploding as supernovae only because they lost enough mass in their winds. A Stellar wind bubble is the astronomical term usually used to describe a cavity light years across filled with hot gas blown into the interstellar medium by the high-velocity (several thousand km/s) stellar wind from a single massive star of type O or B. Weaker stellar winds still blow bubble structures though, and these are also called astrospheres. The heliosphere blown by the solar wind, within which all the major planets of the Solar System are embedded, is in fact a small example of a stellar wind bubble. 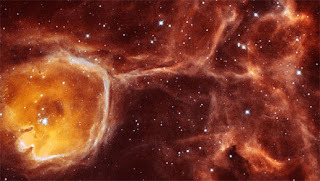 Above is a Hubble Space Telescope image of a bubble-like cavity, called N44F, 35 light-years in diameter, which is being inflated by a stellar wind from a very hot star once buried inside a cold dense cloud. The central star in N44F is ejecting mass at a rate greater than a 100 million times that in the solar wind. The particles in this stellar wind move at 7 million kilometers per hour, compared with about 1.5 million km per hour in the case of the Sun. N44F is located about 160,000 light-years away in the Large Magellanic Cloud. Jupiter will be high in the south on Wednesday, easily spotted in the Teapot of Sagittarius, which is pouring onto the tail of the scorpion, Scorpius.